British Prime Minister Tony Blair has issued a warning to Iran, saying "information" linked it to recent bomb attacks on British troops in Iraq. He said evidence led either to Iran or its Lebanese militant allies Hezbollah, although "we can't be sure of this". He warned Iran that there could be "no justification" for interfering in Iraq. Mr Blair was more diplomatic than the UK official who had first made the charge on Wednesday, but the allegation remained, the BBC's Paul Reynolds says. Iran has denied any role in the blasts that have killed eight British soldiers in Iraq in the last five months. Speaking on Iranian TV, foreign ministry spokesman Hamid Reza-Asefi said: "This is a lie. 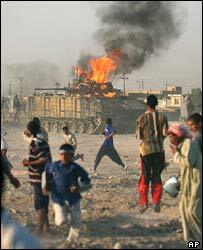 The British are the cause of instability and crisis in Iraq." He said Iran had no reason to interfere, as Mr Blair suggested, declaring that "a stable Iraq is in our interests". The Tehran-backed Hezbollah meanwhile issued a statement denouncing Mr Blair's claims as "lies" and "excuses to justify the inability of the occupation to confront the rise of resistance inside Iraq". Iraqi politicians have also expressed deep reservations about the British allegations, which have come amid increasingly tense relations between the UK and Iran over the apparent collapse of negotiations about Iran's nuclear programme. Speaking at a joint news conference in London with Iraqi President Jalal Talabani, Mr Blair said it was clear "that there have been new explosive devices used - not just against British troops but elsewhere in Iraq. "The particular nature of those devices lead us either to Iranian elements or to Hezbollah... however, we can't be sure of this," he added. British Foreign Secretary Jack Straw said the UK hoped to discuss the evidence with Iran. "We look to the Iranian government to sit down with us, hear what we have to say and take action where appropriate," he said. The UK official who had spoken anonymously on Wednesday had said the bomb technology had come from the Tehran-backed Hezbollah militia in Lebanon, via Iran, to dissidents from the Mehdi army, a militia controlled by the radical Shia cleric Moqtada Sadr. A Mehdi Army leader, Ahmed al-Fartusi, was arrested by British forces recently, sparking anti-British protests in Basra, southern Iraq. Iraqi Prime Minister Ibrahim Jaafari, a Shia, dismissed the suggestion of Iranian involvement outright. "Such accusations are baseless and we do not agree with them at all," he said. "Relations between Iran and Iraq are currently very friendly and strong and expanding. We are proud of the situation." 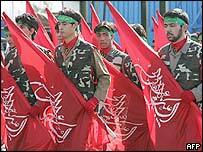 Most Shias, who form the majority in Iraq, are sympathetic to the authorities in Iran. Speaking in London, Iraqi President Talabani also expressed his doubts, saying: "I personally talked to some Iranian brothers: they denied it." 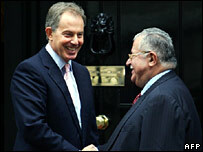 At the conference Mr Blair assured Mr Talabani that British troops would stay in the country "as long as he wants them". He spoke on the same day that more than 10 people were killed in Baghdad in the latest of a string of almost-daily bomb attacks.